When hiking, it is really important to follow proper trail etiquette. By doing so, you’re ensuring that your fellow hikers are having an enjoyable experience, while also maintaining the true beauty and habitat of nature. Many websites and books have standard hiker etiquette codes listed, which includes stuff like pass on the right or hikers ascending have the right-of-way. After spending some solid time on the trail, these etiquette guidelines become second nature and are pretty much commonsense to most hikers. However, over the years, I have come up with five additional hiker etiquette rules that I follow and wish other hikers did too! Let me share it with you. 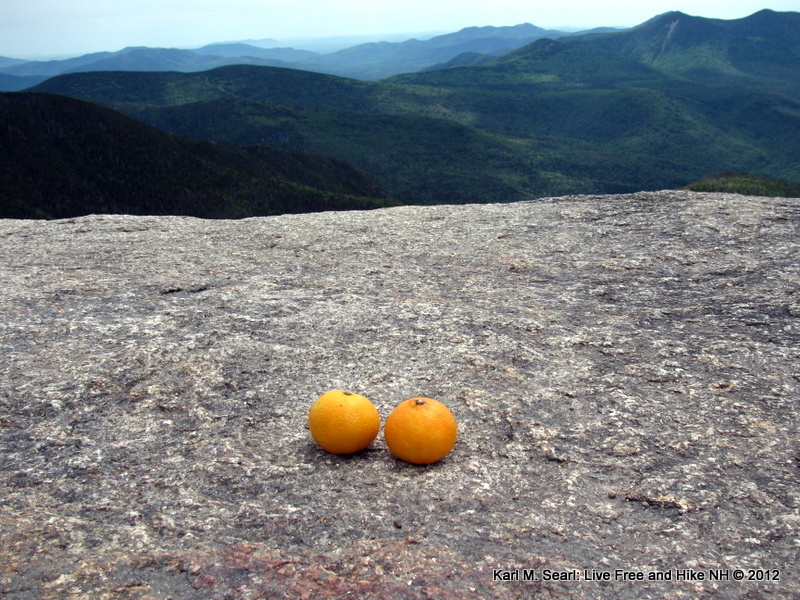 My Clementines on Mount Osceola…Peels came home with me! Don’t litter…I know what you’re thinking. That’s on every hiker etiquette list around…no brainer. However, I’m not talking about the obvious stuff (plastic bottles, etc.). I’m talking about the stuff people claim is biodegradable, therefore is okay to dispose of on the trail. Stuff like tissues, orange peels, apple cores, etc. I understand these things breakdown faster than say, an aluminum can, but nonetheless, they need time to breakdown. Did you know it takes 180 days for an orange or clementine peel to breakdown? How about tissues…2-5 months! Most of all, it destroys the beauty of nature. When I hit the trail, I’m completely attentive to all things on the trail…wildflowers, ferns, mushrooms, brooks. To find a tissue in the middle of these amazing features disgusts me. So, pickup your garbage, even the stuff that breaks down faster than “typical litter”! Throw it in your compost pile when you get home. 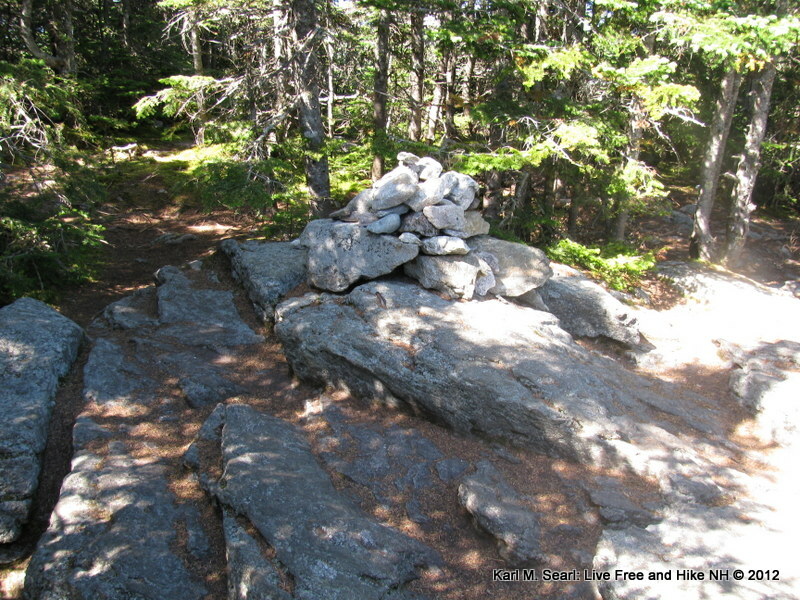 Mount Tecumseh Summit…don’t be a summit hog, even on small summits like this one! Don’t be a summit hogger!!! There are a lot of cool things on different summits. Some have signs, others have benchmarks, some have towers and some just have limited space! If you’re on the summit, remember that everyone else up there made the journey just the same as you. Don’t hog the features so others can’t enjoy them. If there is a benchmark, maybe it’s not such a good idea to plant your pack there for lunch…right? If there is a summit sign, people may want to get a picture with it, so if you have your trekking poles leaning against it, they may get in someone’s way…right? Quick story, my wife and I climbed Tecumseh (second attempt, first was a disaster) and when we made it to the top, these three people had set up camp (yes…all they were missing was a tent) on the summit cairn. They were spread out to the point where Jill and I had to eat lunch in a spruce tree…I’m not exaggerating. We didn’t feel welcome to check out the cairn or take summit shots, because those hikers were monopolizing a small summit. It was definitely a significant summit in our journey but we were not able to enjoy until these people left. That is not how it should be. Everyone should be able to enjoy the summits together and share the features without feeling like you’re banished into a spruce tree! Oh, and they left a pile of dog food on the cairn too (see #1 above)! So, share the summits with your fellow hikers. They can get crowded, but that doesn’t mean everyone can enjoy them. Why is someone yelling! Have you ever heard someone talking very, very…very loudly on the trail to their hiking partners? I understand how this can happen since sometimes you’re leading a group and you try to talk loud enough for them to hear you in the back. However, when I hike, sometimes I enjoy the peacefulness of the nature. Also, I like to talk with my hiking group too. If another hiker is drowning out a conversation I’m having with someone I’m hiking with right next to me, chances are…you’re being too loud! Mount Washington…don’t ask someone if you’re almost there at this point! There you have it! These are my five additional hiker etiquette guidelines that should be added to all the standard lists…in my humble opinion. I hope you didn’t think this was harsh and took my sarcasm in jest as I was trying to get my points across in a fun way. I find hiking extremely pleasurable despite what I have listed above. In no way do any of these things ruin my walks in the woods nor should it ruin yours. I hope this post makes you stop and think the next time you peel that clementine on the trail and convinces you to stuff the peelings in your garbage bag in your pack. About Karl Searl: Karl is one of the nicest people in the outdoor blogosphere and he writes some of the best New Hampshire hiking content. He has lived in New Hampshire most of his life and currently resides in the seacoast region with his wife, Jill and his daughter, Lylah. By profession, he’s a mechanical engineer, but his true passion lies in the White Mountains of New Hampshire. Whenever possible, he tries to get out on the trail with his family and friends and enjoy what the New Hampshire wilderness has to offer. 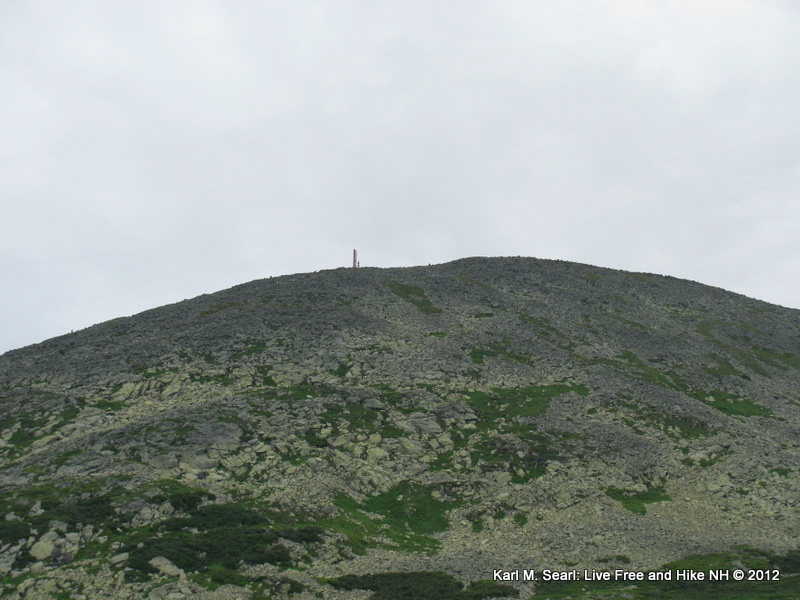 He shares his adventures on Live Free and Hike New Hampshire, his day hiking blog. You can visit Karl’s blog at http://livefreeandhikenh.blogspot.com. Karl tweets at @LiveFreeAndHike and you can follow Live Free and Hike on Facebook at http://facebook.com/LiveFreeAndHike. Little bit of a confession here… I have been known to discard of stuff such as orange peels, apple cores, etc on the trail. However, I don't place it in view of others. I tend to throw it into the trees. I know that does not make it better, but I will make a point of packing even that stuff out next time I hike! I love the one about being a summit hog! That drives me crazy. On a trip to Isolation recently, an otherwise very nice set of ladies was sitting directly ON TOP of the summit marker. Being the obsessive compulsive that I am, I had to ask her politely if she could, you know, MOVE IT, so I could tag the marker! Matt – Thanks for taking the step toward bringing the peels out of the forest! You are certainly not alone and I don't think any throws them down thinking it is littering, because they are biodegradable. I wouldn't beat yourself up about it! Dan – I know exactly what you mean! If I made the trek out to Isolation, damn straight I would make someone get off the marker so I could tag it!!! Trish – I know what you mean and I do agree. I suppose I'm thinking about a few people I have met on the trail through the years that…it wasn't their pace, they just…I don't know, maybe they didn't want to hike alone or something. But they would stop like every time they passed us…for miles!!! We should have just hiked together!!! Great post and lots of good points. I don't agree with “Am I almost there?” Most of the time it's more of a friendly greeting to a passing hiker, such as “How are you?” Answer what you wish and smile. P.S. Can you get out more on the weekdays? I don't run into many of these problems during the week. Great points. When I first started reading about the orange peels, I was thinking you were being too picky. But you make a great point about not wanting to see it on the trail as it ruins the atmosphere. I really appreciate reading things like this. I have never hiked frequently (until I got to Patagonia), so I want to make sure I'm not being a bad hiker! Great Post! It drives me nuts when people don't give ascending hikers the right of way!!! I wish more people could adopt these principles while their out on the trail. I may be guilty with one or two of the things you've mentioned but I promise never to do them again! This a great post and gives me a better understanding and respect of what hiking is really about. I am most definitely not a summit hogger. Alexis, thanks for the comment! I have broken all of these guidelines many times, it is all good! I am glad you enjoyed the post. Hi! I think you have many great points. I also want to add that it is also common courtesy to greet other hikers as you pass them. A simple “hi” or “hello” is sufficient enough and it is to acknowledge that you and/or they are there and everyone continues on their merry way. I have read other sites where they mention to also “nod” at other hikers as another way of greeting but what if some hikers are not making eye contact and they're just paying attention to their surroundings for protection or for other personal reasons? So I say it is best to verbally greet so you are being heard. We're not asking for a conversation just a 1 second acknowledgement. Although, if you wanted to stop and converse with me, I wouldn't mind since I'm also a people person. And last, it is important to greet because you may end up making a new friend or you may get caught in an emergency situation where they can help save your life! You never know. That's why it's important to ALWAYS greet! I found my way here because I was wondering whether it was just me annoyed with summit hogs … last trip I reached a spot where a family had spread themselves all over the best part of the outlook, packs and all, hardly any room for anyone else. And the alpha male, who was deeply into the role of Hiking King just droned on and on about various stuff. It was clearly very important to him that everyone knew he Knew Everything…. I was quite happy when they packed up and left.